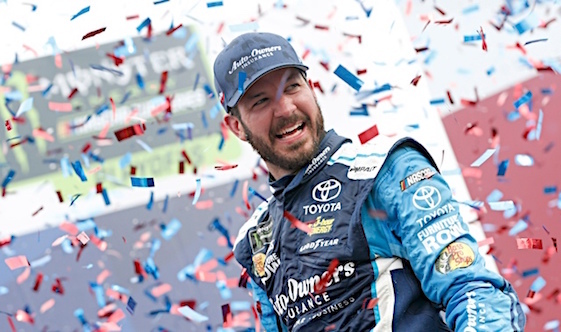 Racin’ Today » The Magic Keeps Building For Martin Truex Jr. The Magic Keeps Building For Martin Truex Jr.
CONCORD, N.C. – Four years ago Martin Truex Jr. didn’t know if he would ever have the opportunity to race competitively in NASCAR’s premier series again. In 2013 Truex found himself without a sponsor and without a ride due to fallout from a team orders scandal at Michael Waltrip Racing. Following the season’s final regular season race at Richmond, NASCAR ruled MWR had manipulated the event’s finish by ordering MWR driver Brian Vickers to slow his pace. A late pit stop by Vickers and a suspicious spin by MWR driver Clint Bowyer caused a late caution that helped Truex make the playoffs as a wild card. After reviewing everything, NASCAR removed Truex from the playoffs. Shortly thereafter, Truex joined Colorado-based Furniture Row Racing. Today, he is enjoying a magical season. He captured his second victory at Charlotte Motor Speedway, his fifth on a 1.5-mile track this year and sixth overall in Sunday’s Bank of America 500. Now, Truex appears to be on track to capture his first Monster Energy NASCAR Cup Series championship. That wasn’t the case, though, when he joined Furniture Row. Truex points to team owner Barney Visser, his vision and his determination to become one of the sports top teams as the key to the organization’s current success. But Visser never gave up and the only change that was made was in the crew chief position. Todd Berrier wanted to return to North Carolina and Cole Pearn filled the vacancy. In obtaining his 13th career victory, Truex led twice for 91 laps, but at the race’s beginning he didn’t believe he had a chance at winning. His poor qualifying run left him in the 17th starting position and Pearn noted losing practice on Saturday due to rain adversely affected them. Truex surprisingly finished Stage 1outside the top 10. He started Stage 2 in 14th. However, when pit stops occurred during the fourth caution period, Truex’s crew returned him to the track in seventh. His crew gained him three more positions during the fifth caution flag. Truex finished Stage 2 in fourth. His pit crew then gained him another two positions during the ensuing stop. They performed flawlessly, again, during the eighth yellow flag and returned him to the track in the lead. Truex maintained the No. 1 position for the final 57 laps, which included two more caution periods. “The pit crew just put us on their backs and got us up front,” Pearn said. Truex’s victory guaranteed him a position in the playoffs round of eight as the series heads to Talladega Superspeedway, the playoffs’ wildcard due to restrictor-plate racing’s unpredictability. It’s a position that has left Truex and Pearn breathing a sigh of relief. Truex’s Charlotte victory came on an extremely humid day that left several drivers needing medical attention after the event, including Kyle Busch and Ty Dillon. Busch exited his race car, which incurred damage in three incidents, and collapsed on the frontstretch’s apron. He later walked to the ambulance after receiving attention from medical personnel. Busch was then treated and released at the infield care center.